Free vector graphic editor Inkscape has color extensions to change hue, saturation and lightness by default. They are "More Hue", "Less Hue", "More Saturation", "Less Saturation", "More Light" and "Less Light". They can be called from "Menu" -> "Extensions" -> "Color". However, they are not convenient. So I integrated these extensions to one. This new extension is free to use. Create two files "color_huesaturationlightness.inx" and "color_huesaturationlightness.py" under ~/.config/inkscape/extensions/ or /usr/share/inkscape/extensions/ directory. Contents of these files are as bellow. 1) Select objects to change color. 2) Select "Menu" -> "Extensions" -> "Color" -> "Hue Saturation Lightness...". 3) Then a pop up window comes up. Change values as you like. This software is FREE, but ABSOLUTELY NO WARRANTY. If any bugs, please add a comment. Fixing bug is most welcome. 1) Fixed bug coursed by HTML converting. 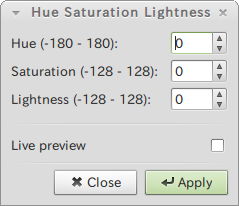 2) Changed Name from "Hue Saturation Light" to "Hue Saturation Lightness"